People’s movements, unions, and federations of rural workers are organizing a number of protests this month to demand public policies for rural areas. The demonstrations are dubbed “Red April” and take place every year, especially during the week of April 17th, International Day of Peasants’ Struggle. 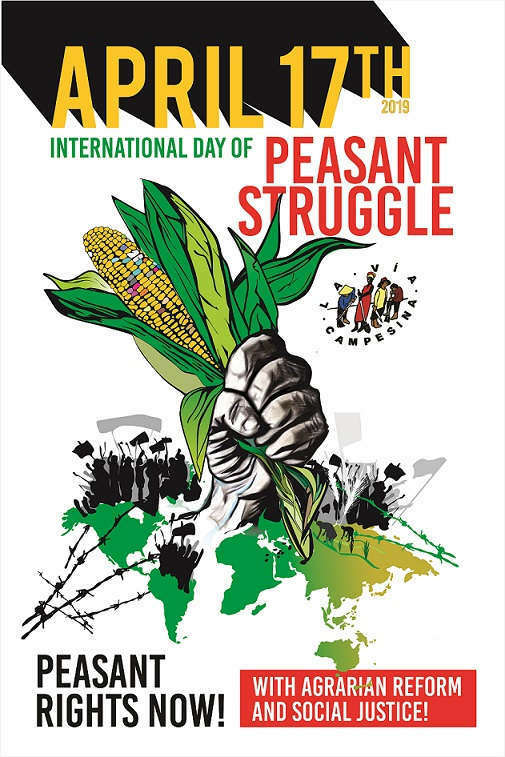 The date was established by the organizations that are part of La Via Campesina, which organize activities in more than 70 countries. It is also part of Brazil’s official calendar, as a day to commemorate the memory of 19 landless workers who were brutally killed by military police officers in Eldorado dos Carajás, in the northern state of Pará, in April 1996. This is the first nationwide mobilization for land reform under the far-right Jair Bolsonaro administration in Brazil. With the slogan “Peasants’ rights now, with land reform and social justice,” the organizations will stage demonstrations and activities to push for advances in public policies for rural areas. Marina dos Santos, a member of the national coordination of the Landless Workers’ Movement (MST), says that there is no other way to fight inequality if not by carrying out a land reform. “We believe that land reform still is one of the major ways to solve problems that the people have and promote social justice, creating jobs, producing quality food that is sufficient, inexpensive, and healthy,” she says. In December 2018, the United Nations adopted the Declaration on the Rights of Peasants and Other People Working in Rural Areas, a document that aims to secure access to and control over land, seeds, water, and other natural resources to peasants and rural communities. “The declaration is a very important tool that society has to know about, so that it can have States comply with it, creating and implementing policies to strengthen peasant and family agriculture. It is also a legal instrument to defend struggles, actions, peasants’ resistance in Brazil and the world,” Santos adds. The MST will promote rallies and demonstrations during the week, such as setting up a youth camp in the area where the massacre happened, to pay tribute to the struggle of the landless workers who were killed 23 years ago. Santos points out that the protests are important to expose that the project of the Bolsonaro administration is destroying the land reform policy that the country had been implementing since the democratic transition in the country, in the mid-1980s. “The country has never approved the use of so many pesticides in such a short amount of time, requiring so little paperwork, and passing them so hastily. And Brazil is already one of the biggest pesticide producers and consumers in the world. They want to increase the production and profit margins, but who will suffer the consequences?” the landless activist says. She also mentions the attacks against Brazil’s Institute for Colonization and Agrarian Reform (Incra), saying that the government will make it harder to pinpoint the properties that are not fulfilling their social function, which is one of the responsibilities of the agency. A member of the MST in the northeastern state of Maranhao, Divina Lopes says that the government’s projects will impact both urban and rural communities. She also mentions other topics that should be addressed. “The pension reform bill pushed by this government is a wicked plan to hijack the rights of the poor and protect the wealth of banks and big corporations,” Lopes claims. “We, workers from rural and urban areas, cannot allow the Incra and the Funai [National Indian Foundation] to be destroyed and dismantled like this. We’ve been witnessing more and more episodes of violence against and the violation of human rights of peasants, indigenous communities, and quilombolas [residents of rural settlements set up mostly by escaped enslaved people of African descent],” the activist says.